As some of you may (or may not) know, I have a tattoo of a Clemson Tiger paw on my right hip. I got it five or six years ago, and my parents still don't know about it. I've been vigilant about hiding it from them---always wearing high-waist bathing suits when I go to the beach with them or to the pool with my nephews and nieces. My parents are really old-fashioned and believe that tattoos are dirty, transmit diseases, defy your temple, and all that. Okay. First of all, this isn't the 1960's. We aren't tattooing each other at home with sewing needles anymore (well... most of us aren't). More importantly, where do we draw the line? Who decides what can and cannot be done to our body? Who decided that tattoos are a sin? There are christian denominations that believe you shouldn't wear makeup. That you shouldn't pierce your ears. That you shouldn't cut your hair. That women shouldn't wear pants. Which denomination is "right"? The Scripture is interpreted in many different ways, all over the globe. Some interpretations are more literal in their beliefs, while others are more philosophical. I fall somewhere in the middle. I tend to be more realistic. The Bible was written thousands of years ago. Believe it or not, life was a lot different at that time. Everything about our way of life was different then. People sacrificed their cherished animals, to serve as an offering to God. Yet, we don't sacrifice our pets and offer them up to God at Sunday morning's worship service... do we? Leviticus 19:28 is the verse Christians often quote when they're asked about why they believe tattoos are forbidden and considered a sin. The King James Version states, "Ye shall not make any cuttings in your flesh for the dead, nor print any marks upon you: I [am] the LORD." This verse seems to state, rather clearly, that you should not print any marks upon you (aka get a tattoo). However, if you continued to read the rest of Leviticus or took the time to understand the historical events taking place during that particular time, you might interpret the verse a bit differently. At the time Leviticus was written, it was customary to carry marks on your body in honor of the object of your worship. It was customary for the Amorites to cut their flesh whenever someone died. Even members of the royal family; they would cut off a part of the ear, shave the hair round about, cut the arms about, wound the forehead and nose, and transfix the left hand with arrows. There were some who marked their body with a known figure, by burning themselves, for the dead. It was customary for the Gentiles to imprint the mark of an idol on themselves to show they were his servants. Wounds filled with ink (aka tattoos) were used to symbolize a devotion to an idol or a god (which, understandably, would be considered a sin). Other times, they were used as a sacrifice or dedication to a deceased family member. Sometimes, they were printed on their body for superstitious reasons. Today, most people get a tattoo because they like the way it looks. It's a form of art and expression. Most of us are not getting tattooed to honor an idol or defy God in any way. The scripture ends with "[I] am the Lord." I think God's point is that He, and no one else, is the Lord. He was telling us that we should not sacrifice our bodies or harm ourselves to glorify anyone else. Your body is your temple... to me simple means just that... the Holy Spirit lives inside me. I don't think God really cares if I have my ears pierced... or that I wear make up or that I get a tattoo... as long as I live my life in such a way that gratifies Him. So, what do you think? The reason I ask and have been researching this is because I want another tattoo. I have wanted a peace dove for a very long time but never knew where I wanted to get it... which was difficult because it needed to be a place that my parents would not see. Now, I have come to the conclusion that I am just going to tell them that I have the one I already do and tell them I'm getting another one. I am nearly 30 years old. They may be disappointed and urge me not to... but hopefully, when I explain how I feel about it (like I just told you) they will be okay with it. I have decided that I want the tattoo on my left shoulder. However, I am still open to ideas. It wouldn't be very easy to hide a tattoo on my shoulder from my parents for long. I have decided I want the peace dove... which I have taken several different photos from the web that I like... with John 14:27 printed underneath it in Greek lettering. 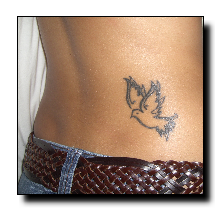 The dove symbol in Christianity represents the Holy Spirit... as well as peace. Luke 3:22 says "... and the Holy Spirit descended on him in bodily form like a dove. And a voice came from heaven: "You are my Son, whom I love; with you I am well pleased." In Genesis 8 - after the flood, Noah sent out a dove who returned with an olive branch that indicated the end of God's judgment and a new covenant for man. In addition... the symbol of the dove is a universal symbol of peace. I think its so amazing that you took the time to look up versus on this subject matter and even more amazing that you wrote a post about. I personally feel that it's whats in your heart that counts and if you want to get another tattoo then you go girl! i got my first tattoo in august of last year. i made sure to tell my mom before i got it done so she wouldn't be mad at me later. she's fine with it and even likes it. my dad on the other hand will NEVER know. he said he'd rather see someone burn alive than get a tattoo. he's very dramatic. but i agree...a lot of what was written in the bible was done 1000's of years ago. even our constitution changes it's laws all the time. as long as we live to serve Him, it shouldn't matter whether we have tattoo's, drink beer, smoke, pierce our ears, cut our hair, fornicate before we get married, etc. I love those and I love that you took the time to research all the scriptures. I ran across your site from the Spring Swap. I'm new to this whole blogging experience. I'd appreciate your follow. thanks for the thoughtful blog post...ran across it trying to decide on a tattoo for my big 3-0. 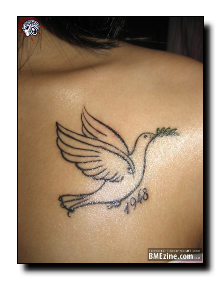 I definitely want a dove but trying to work with the two tiny stars that are already on my back...ideas? I am actually on the GA coast, but from ATL...looking at having it done in savannah. Thanks for sharing! I have a tattoo of a dove on the left side of my back, close to my rib cage. The reason I got a dove was because of John 14:27, and I plan to incorporate this verse into my tattoo later on. God works in wonderful ways, and my tattoo always reminds me that He is the ultimate source of peace. I know that I should never fear anything, for He is always with me.